When a patient is living with limited mobility, even moving from a bed or chair to a different resting space can prove to be a difficult and time consuming task. For those living in hospitals and nursing homes or receiving at home healthcare, patient lifts are most often used to make this transfer easier by suspending the patient and moving them to another position. 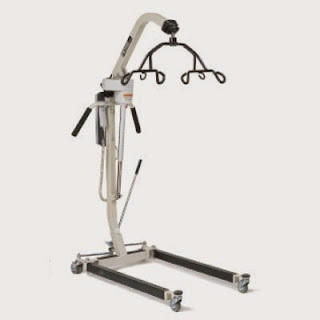 From Hoyer, a trusted name in the industry for over 50 years, comes the Hoyer Deluxe Power Patient Lifter, a lifter with features that allow for greater movement and more ease of transfer. One of the greatest features of this product is the spread on the 6-point cradle that the sling attaches to. The wider spacing prevents any pinching of the patient when they are strapped into the sling, providing greater comfort when being transferred from one area to another. The cradle works with a variety of different Hoyer slings, including both 4 and 6-point slings. For greater comfort during transport, the speed actuator is reverse-mounted to allow for more leg clearance and ergonomic handle grips decrease pressure on the back. The HPL402 also has leg guards and caster bumpers to protect the patient and walls, furniture, and surrounding areas during transfer. This unit is fairly easy to operate and features both a mechanical down-release lever for non-powered lowering and electronic buttons with “up” and “down” buttons for hand control. An adjustment handle allows the caregiver to widen and narrow the base as necessary. The U-base also has a 5.5” clearance, so it’s easy to roll under a bed or other obstacles when transferring the patient. The Hoyer Deluxe operates using a gel cell battery that becomes fully charged after 6 hours of charging. With features for comfort and ease of mobility throughout any space, this Hoyer lift transfer device is ideal for anyone that needs to be lifted between beds, chairs and other resting places. Shop this unit at PHC Home Medical Supplies and get it at a fraction of the list price!